If you fell in love with Mlle. Sophie's classic designs in Stylish Knit Scarves & Hats, you will be thrilled with the clean, modern look and international flair she brings to this collection of blankets and throws for the home and family. Her designs have a timeless vibe that works well in any décor; just change the yarn color to suit your favorite palette. The 18 fun-to-knit patterns are suitable for beginners but with just enough detail to keep the knitting interesting. Knit for your family room, nursery, bedroom, and more. A stylish throw makes any room more welcoming. A blanket makes a great gift, too. Send off a recent grad to college with a throw in school colors. Welcome a baby with fluffy softness. Warm a home with a new elegant afghan. This is a book that you will turn to for years to come. 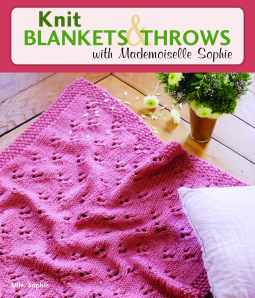 This is a great book for not just new knitters but seasoned ones also. There are 18 patterns here and a nice variety of styles using different yarns. With an introduction that gives knitting lessons that include diagrams on the basic knitting stitches making this a great little reference book. While this is the ebook format I downloaded it to my iPad so I could view it in color. Thanks to the publisher for an advanced copy (via netgalley).